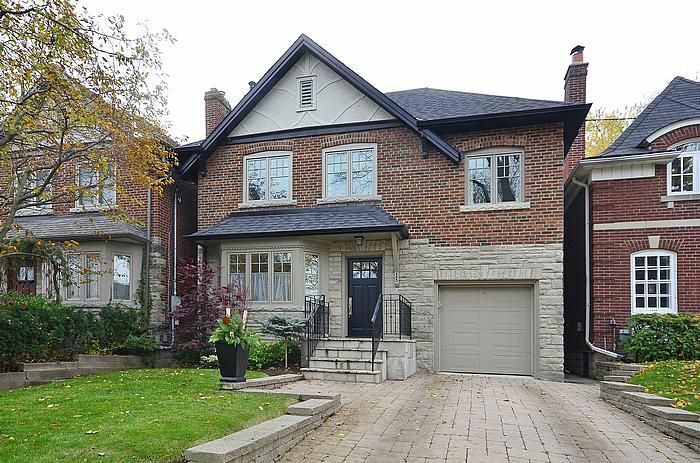 Rare five bedroom home situated on a desirable quiet block just steps from top rated Allenby Junior Public School and all the wonderful amenities on Eglinton Avenue. This lovingly maintained home boasts original charm and has been beautifully updated with many renovations and a new second story side addition. Spacious principal rooms, three baths, finished rec- room, and a side entrance are perfect for a growing family. Private driveway, hardwood flooring, wood- burning fireplace, wainscoting, updated mechanics, new roof and new Ridley windows are just a few of its many features. The main floor is welcoming and bright. Sliding doors off the kitchen lead to a lovely south facing private, professionally landscaped garden with interlock patio and Jungle Gym. The second level features five bedrooms, two baths and a cedar closet. A finished rec room with an office, four piece bath and ample storage is ideal for kids. The interlock drive with two car parking leads to flagstone steps and a custom designed front door. Easy access to the downtown core and the subway at Yonge and Eglinton. Enjoy the many surrounding parks, local shops and restaurants. Wonderful opportunity for a growing family desiring proximity to one of the best schools in a terrific neighbourhood.